Senior editor and Business Manager. Gordon L. Anderson is Executive Director of Paragon House Publishers, Secretary General of Professors World Peace Academy, and Editor in Chief of International Journal on World Peace. He earned an M.Div. in Christian Ethics at Union Theological Seminary in New York City and his Ph.D. in Philosophy of Religion at the Claremont Graduate University. He has taught at the Unification Theological Seminary and lectured in over 40 countries around the world. He has published widely on religion and society, including editing The World Wide State of the Family, co-editing Morality and Religion in Liberal Democratic Societies, and authoring Philosophy of the United States: Life, Liberty, and the Pursuit of Happiness. He is Senior Editor and Business Manager for the New World Encyclopedia. He serves on the Board of Trustees of the University of Bridgeport. He is listed in Who's Who in the World, Who's Who in the America, Who's Who in Education, and Who's Who in Finance and Industry. Video interview of Gordon Anderson about New World Encyclopedia on Universal Peace Television. 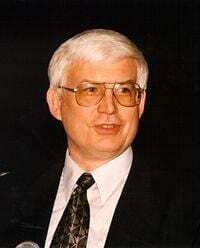 Gordon L. Anderson, Ph. D.
This page was last modified on 5 January 2008, at 18:20.